Around 4:30 AM we got up and headed out to drive around the base of the Santa Ana mountains that I was about to spend the day boring 50 miles through. I'd just found out that one of my pacers for Angeles Crest was going to be deployed during the race and it made me think about how fortunate I was to be running while so many other people had much harder things to deal with; tsunamis in Japan, revolutionary wars in the Middle East and newspaper bombs in Vacaville. Of all the task I could be tasked with, of all the responsibilities I could be responsible for, all I had to do was enjoy the mountains and run as fast as I could.. I got to check-in a little late, but was ready to go in no time, and met Thomas and Jorge on the start line. 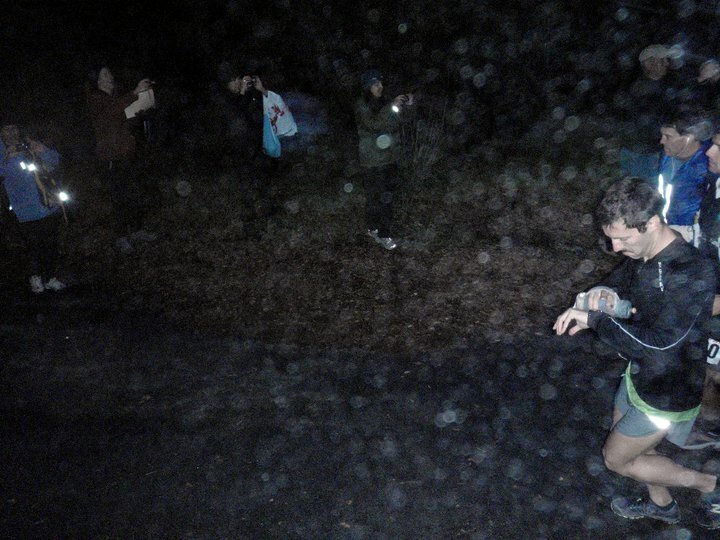 We talked for the first couple miles of the race about ultra news and other trivialities. I led the first 10 miles and started to pull away as I dropped through the steeper, more technical sections with great ease in my MT101's. Usually thicker shoes like Jorge's trail 905's give the advantage to downhill running, but for some reason I was really dialed in with my MT's and ended up easily putting a good 4-5 minute lead on Tom and Jorge by the candy store aid station (mile 10). I had to use the bathroom and lost a couple minutes of my lead. 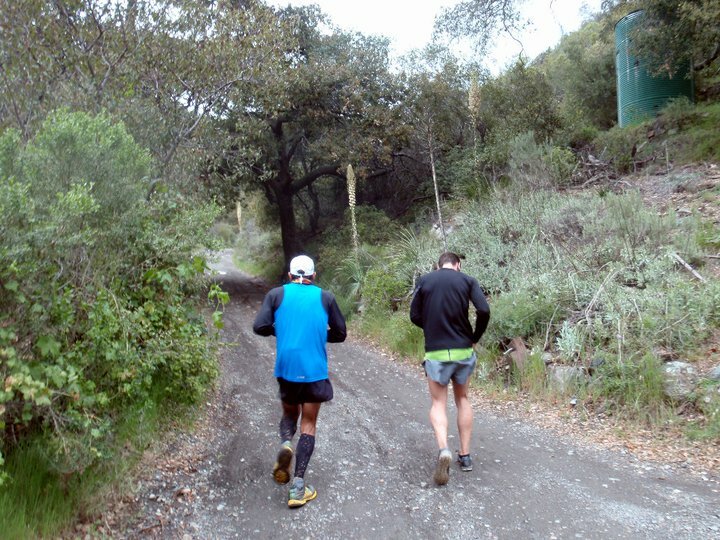 As I got back onto the trail, I wasn't worried about holding on to the lead as I knew heading back up to Bluejay (mile 20), that Jorge and Tom were two good climbers, and trying to out run them now would be foolish since they would catch me sooner or later. 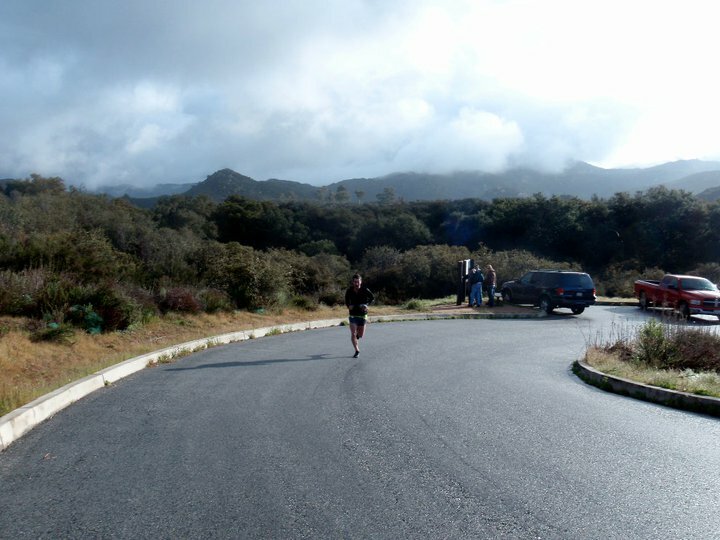 I focused instead on the climb at mile 28 heading up Holy Jim, and trying to be fueled and physically ready to attack it. Jorge, Tom, and I came into Bluejay together. I let Jorge push pretty hard up the fireroad to Trabucco trail (mi 23), and he put about a two minute lead on me and Tom. I was running the downhill more aggressively than anyone that day and caught up to him halfway down and had a minute lead on him when I had to throw up. I had tried to take a gulp of a Gu too fast, and the stomach said no. I realized I hadn't had any run in the last few months where I'd aggressively ate Gu and Saltstick and I was now paying for being too stingy. The calories I thought I'd been banking were now on the ground, and I had to find a way to get my stomach back on track. Coming into Holy Jim (mi 28) I was happy to see Kd and a well stocked aid station with watermelon and cantaloupe. 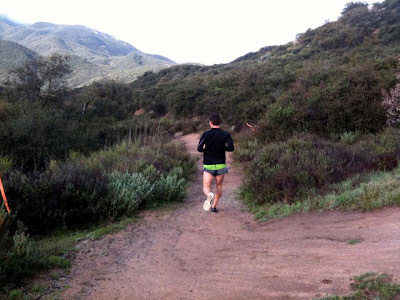 The simple truth was, I had gambled on how hard I could run and digest food, and now I was going to pay for not training myself enough to know my gastro-intestinal limits. As much as I tried to work with my stomach to to get back on track, the damage was done. I climbed up Holy Jim (a climb that I had smoked a several times in training) pretty gingerly. As much as I tried to work with my stomach to turn over, eating Gu, and taking walking breaks to process it, it simply wasn't having it. 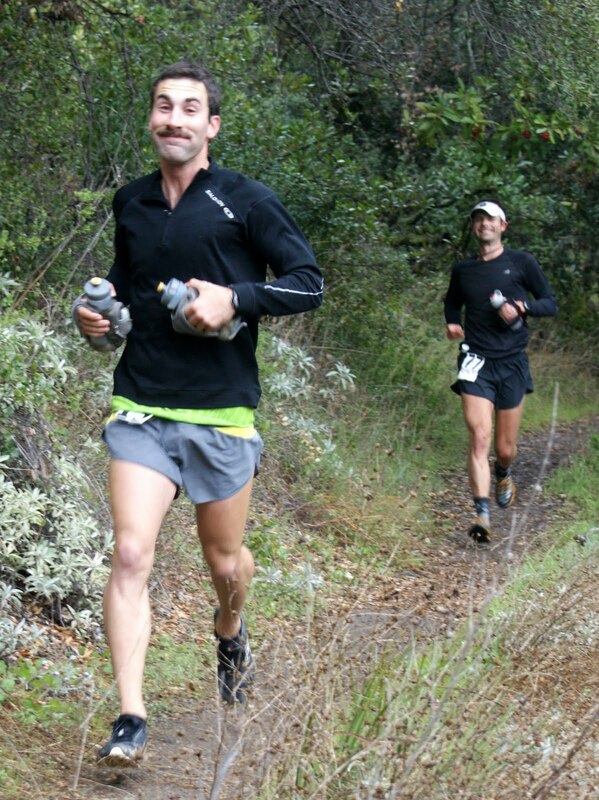 When I reached Bear Springs (mile 32), Thomas was on my heals and Jorge was at least 5 minutes ahead. Though the others weren't necessarily flying at that point, they knew well enough to get up to Santiago Peak (mi 35) in a hurry to bank time on me for the return on the ridge where I still could push the downhill into the finish. I saw Jorge a good 3/4 mile from the top, and Thomas not far behind and knew they had a big lead on me. The magnitude of their lead was so great that it was really hard to fathom having a chance to catch up with them, but I turned up my Rocket Summer tunes and focused on at least having my best possible race. I blitzed the downhill into Bear Springs (38) and went to my drop bag to change to fruit snacks. The higher sugar content gave me a boost, but the toll of running hard up Santiago with not enough calories had zapped my quads. Returning along the ridge proved to be tougher than anticipated, and I ran nearly identical splits to Thomas as we were about 5-6 minutes apart according to every aid station. 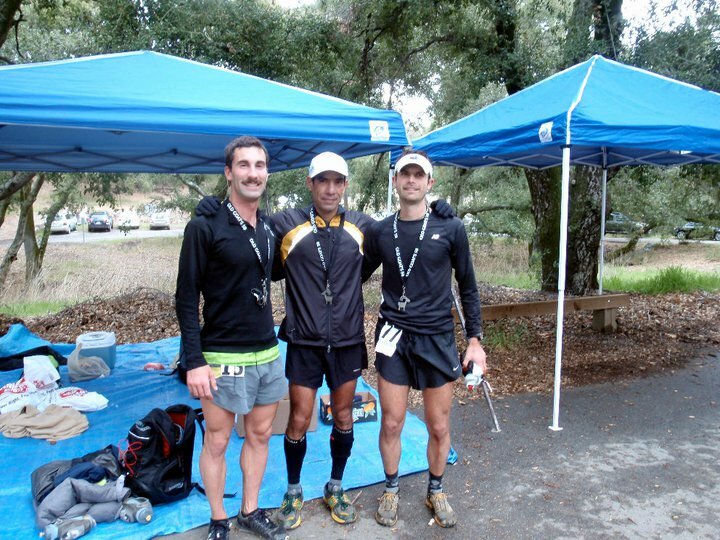 Jorge however had the veteran experience and surged along the ridge to set a 7:31 course record. Thomas finished in 7:44, and I ran a good final 3 miles in in 17:30 to finish in 7:50. Though I wish I could have been a little more on top of fueling, I'm really psyched with my performance. 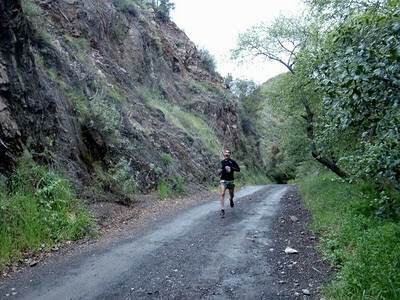 The course is definitely challenging, but I think someday, someone will run sub 7:30, as Jorge said he taking most of the downhills easy. The potential for more consistent climbing and a better fueling strategy make it hard to resist coming back to this race next year to run a more true time. However I'm still very proud of myself for holding on, and running close to the CR pace of 7:50. This is always a special feeling, but especially memorable for me because last years CR was set by Jorge who I really look up to a lot. I wish I could have been the fastest one to break the old course record on Saturday, but I was still grateful to have some really rough spots and still run a time I was proud of. 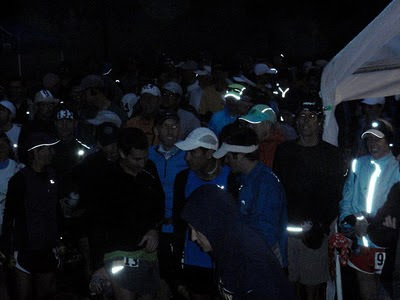 The post race festivities were great (beer and talking about the race with Tom and Jorge and other Old Goats), and the community aspect of ultra running and everything made it a really beautiful day despite the cool temps and the constant drizzle. congrats on the CR and great race! you'll get those wins soon enough, we all know it. SOLID race... and congrats on getting within 10 seconds of the old CR. You're gonna tear it up at Miwok and AC this year!